Musket Smoke II – sidelined.. for now. The kickstarter revealed that the potential ROI risk for MS2 is greater than expected. So for now MS2 is downgraded to ‘side hobby’ and the single player campaign was cut. 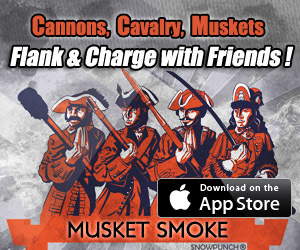 That said, the publicity from the kickstarter has re-booted the Musket Smoke community quite nicely.